This book was exactly what I've been missing! An epic tale with swords, magic, and heroes! 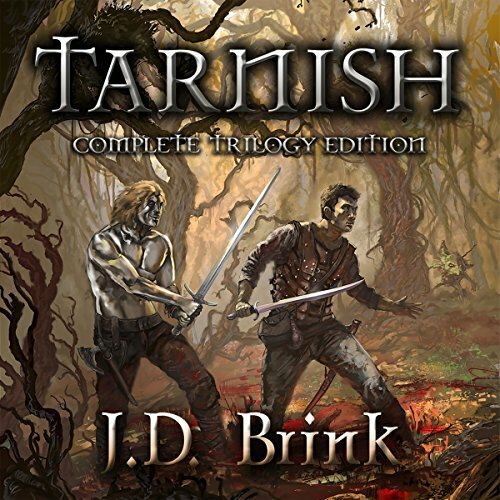 Since finishing series' such as The Wheel of Time by Robert Jordan (James Oliver Rigney, Jr.), and The Sword of Truth by Terry Goodkind, I have been trying to fill a void I didn't know I had, that is until reading Tarnish. While the writing style is different, it's just enough to show the reader how unique J.D. Brink's telling of this type of story is. This is a wonderful fantasy novel with everything a fantasy lover could want. Do not miss out, and lose yourself in J.D. Brink's world. You will be so glad you did! Audiobook Narrated by Todd Menesses: I enjoyed Mr. Menesses' voices and reading very much. He was the perfect choice for this novel, and would be excellent in the next in this series. Wow. That was my first thought when I started this. Just wow. Brink has really distilled the essence of fantasy into an amazing coming of age story. My first thought? Thank God this wasn't another the whole world is going to end and the hope of survival rests on the shoulders of a wet-nosed pup. Secondly, Billy, the protagonist, sort of gets to bear the mantle of both the hero and the villain. So, I am not sure if he is a heroic villain or a villainic hero. I like that aspect, it isn't as cut and dried a fare as you usually get with fantasy. I also appreciated the plot devices that allowed the reader to get some world history, only in an interesting way. I have to admit, most times the bar stories would have taken me right out of the tale, but here, it works and works well. Brinks has created a highly detailed world that is rich and vibrant, and practically bleeds off the page. I could see where some folks might feel that the plot meanders, but not so! Every piece of dialougue or line adds to the tapestry he weaves, and it adds to the story. My only real issue, and it is a small one, was the narrative changes that seemed to be more for a change of perspective than actual story needs. Getting to Watch Billy become Wil was a true gift. It is a long journey for the boy to become the man, and I loved how he had the whole, oh I don't know how to word this properly, I want to say fake it till you make it mentality but that isn't quite right. He had a persona he wanted to grow into, and acted accordingly. I think that Billy's imperfections, errors, and fallability made him real and you couldn't help but like him. The story itself is full of twists and turns, and you know those murder mysteries where you pretty much know who the killer is five minutes after you meet them? Well, the mysteries here never pan out the way you expect, and that was a real joy. You rarely see what is coming, how it hits, and where the bodies land until after the fact. Todd Menesses is a real "talespinner" and does a fine job here, of course I also thought he did great in another of Brinks books, Hungry Gods, so I am not surprised only pleased that he continues a tradition of excellence. I loved the cover to this book, it stands out and caught my eye. It shows the trepidition of the characters, sets a mood, and makes you want to open the cover. So great choice! Even though I did receive a promo code for this review it in no way influenced my considerations of the material, and in fact, inspired me to be more honest. In fact, getting a code generally makes me harsher as a reviewer as I am more often concerned what someone like Me will decide based on my review. What made the experience of listening to Tarnish the most enjoyable? I absolutely loved the innovative take on the classical epic fantasy Tarnish brought to the genre. I didn't start getting into the story until about 40 minutes in, but I'm so glad I stuck with it. By the end of the first hour I was absolutely hooked, and was really sad when I had to pause to do real life things. I just wanted to get back to the book and finish it. I'm definitely adding another work from Brink to my TBR pile to see if his other work is as enjoyable as Tarnish. I also REALLY hope he plans on a sequel. This would be a wonderful start to a series. What was one of the most memorable moments of Tarnish? The addition of the storytellers telling actual stories within the bars and inns was a stroke of genius. It was my absolute favorite part about the book. There is so much trope that goes into this genre anymore that the way this book was structured was a breath of fresh air. What does Todd Menesses bring to the story that you wouldn’t experience if you just read the book? I really can't get over how perfectly suited to this story Menesses's narration was. His enunciation was great, and I loved all his character voices. It was a first class performance. This was a surprisingly excellent fantasy coming of age storyTarnish by J.D. Brink is the first in a fantasy series called The Thunderstrike Saga. This start to a coming of age saga follows Billy Cole as he leaves his small town of Redfield to become an epic hero like those he heard about in tavern stories. The son of and mentored by legendary heroes, he has a lot to live up to. When Redfield is threatened from unknown and magical threats, Bill Cole volunteers for a quest to find help, having been inspired by the heroes of his town. As he faces the dangerous life on the road, he must figure out a way to get help for his home town while maintaining his sense of self and honor. Through this quest, Billy Cole hopes to turn into William Thunderstrike, his alter hero ego. This was a surprisingly excellent fantasy coming of age story. There are two simultaneous storylines. One follows Billy Cole as he embarks on his quest. The other follows the characters in his home town as they deal with increasingly dangerous magical attacks. Both storylines are exciting in different ways. While the action in Redfield is driven by the attacks on the residents, much of the storyline is about the politics of the town. Billy Cole’s adventures are more exciting. He interacts with a diverse cast of characters some of whom are easy to hate, easy to love, and easy to not be sure about. One interesting aspect of this novel was the frequent telling of tavern stories. Throughout the novel, especially the first half, different characters tell epic stories about legends to crowds in taverns. This is so frequent that the plot seems to travel from one tavern tale to the next. But somehow, it works. And these tales tie into the rest of the plot well and help add background to many of the characters. Billy Cole’s coming of age is gradual and he is flawed, which allows his growth to be visible as the story continues. The magical aspects of the novel are for the most part tied to land around Redfield. This part of the novel was unexpected for me and I thought that it was interesting and mystical. Overall, I thought the storyline and the characters were engaging and exciting with good pacing. The narration by Todd Menesses was excellent. He voiced the characters well and consistently. At times, I felt that he spoke a little too fast because I would miss some of the words, but mostly it was great. The production quality was good as well. I would recommend this story to readers who like fantasy coming of age stories.